Siliceous shale outcrops, martime chaparral, knobcone-pine woodland along the immediate coast, 180–650 m.
Erect shrub to 2 m tall; basal burl absent; twigs sparsely to densely soft-nonglandular-hairy, occasionally long-glandular-hairy; leaves grayish, base lobed and clasping, strongly imbricate, isofacial, canescent, and glaucous; lower inflorescence bracts foliaceous, gray-canescent; inflorescence paniculate, 2–4 branched; pedicels finely glandular-bristly; berries glandular- and nonglandular-hairy, sticky (Parker et al. 2013). January to March (can be identified year-round). The “Chalks” (Lockheed) (Santa Cruz County). Endemic to the coastal side of northern Ben Lomond Mountain in the “Chalks” (Lockheed) (Santa Cruz County). 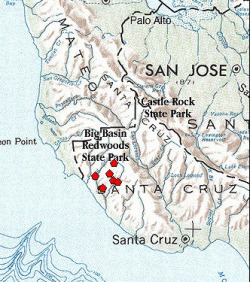 Could been confused with A. regisimontana, A. pallida, and A. pajaroensis, which are similar in general aspect but geographically separated (reports from Monterey, Santa Clara, and San Mateo counties are one of these species misapplied), or A. andersonii, which occurs within its range and intergrades with it. Reports from Eagle Rock are likely misidentified. A green-leaved, glabrous form occurs infrequently throughout populations of A. glutinosa, which botanist James A. West believes is a recessive byproduct of A. glutinosa’s hybrid ancestry (A. canescens x A. andersonii). Reproduces only from seed (does not stump-sprout) and requires mineral soil for germination. 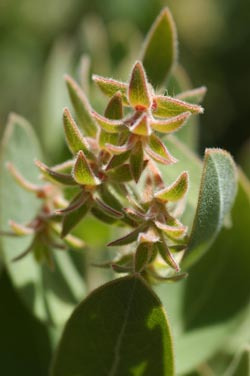 The isolated population on the Last Chance Ridge side of Scott Creek was spared the 2009 Lockheed Fire and contains approximately 250 adult plants (many of them quite old). The extensive population on the upper Schoolhouse Ridge, which encompasses a large, topographically complex area may contain up to 700 scattered individuals (some diseased, some intact) and numerous seedlings recruited since the fire, despite the dessicating, low-nutrient environment (West 2015). Further surveys are needed to ascertain the current status of these populations. CNPS, Rare Plant Program. 2015. Arctostaphylos glutinosa, in Inventory of Rare and Endangered Plants (online edition, v8-02). California Native Plant Society, Sacramento, CA. 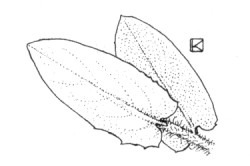 http://www.rareplants.cnps.org/detail/26.html [accessed 1 February 2015]. Parker, V. T., M. C. Vasey, and J. E. Keeley. 2013. 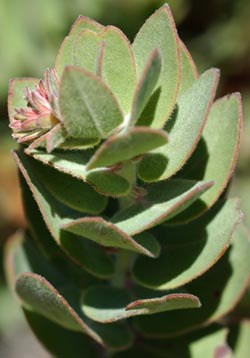 Arctostaphylos, in Jepson Flora Project (eds.). Jepson eFlora, http://ucjeps.berkeley.edu/cgi-bin/get_IJM.pl?tid=13927 [accessed 1 February 2015]. West, J. A. 2015. Traversing Swanton Road. 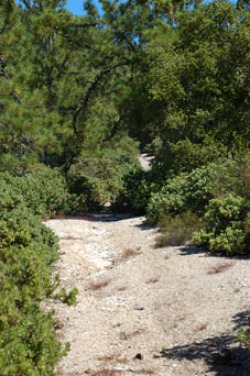 http://arboretum.ucsc.edu/pdfs/traversing-swanton.pdf [accessed 21 January 2015].